Welcome to the neighbourhood of North Delta! This website has the resources to assist you with all your real estate needs, for both those living in North Delta and those who are interested in buying or selling in the area. Whether you are a first time homebuyer, looking to sell your property, or an experienced investor, I can provide you with comprehensive real estate solutions. Beautiful North Delta is situated in the Lower Mainland of BC and is in close proximity to downtown Vancouver, the Vancouver International Airport and the US-Canada border. With a current population of approximately 52,000 and rapidly growing, North Delta is home to numerous parks, schools and recreational activities. North Delta borders Surrey on the east side by Scott Road (or 120th Street) and on the north side by 96th Avenue and the Fraser River. To the west across the river is Annacis Island and Richmond/Vancouver International Airport, accessible via the Alex Fraser Bridge. Burns Bog is to the west, bordered by Highway 91. Clark Drive in Panorama Ridge marks the community boundary to the south. A wide variety of house choices is available in Annieville. In this area you are able to choose from single family homes, townhouses as well as condominiums. With close elementary schools nearby as well as a fun water park to enjoy with family and friends, this is a great location to raise a young family. Housing in Annieville is very affordable and easily accessible to Alex Fraser Bridge. There is a large selection of homes in the Nordel area to choose from. From older rancher/bungalow homes to luxury custom-built homes with spectacular views of Burns Bog and the gulf islands, there is a housing option to suit your personal needs. Sunstone Development by Polygon is also located in the Nordel area. Nordel is home to one of the best recreation and sports facilities available in Delta, Sungod Arena. This area is located approx 25 minutes to the Vancouver International Airport and easily accessible to the Alex Fraser Bridge. 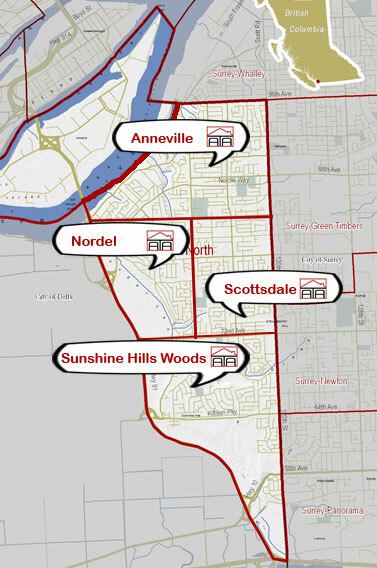 New homes, on large lots, at affordable prices are primarily located in the Scottsdale area and are great for young families looking to purchase a property. In addition, downtown Vancouver is a short 30 minute drive. Condominiums and townhouses are located on Scott Road with restaurants and a shopping center at your doorstep. This area in North Delta also provides walking distances or a short drive to all necessary amenities. Sunshine Hills Woods is home to Delta's largest park, Watershed Park. Enjoy trails for walking, jogging and cycling. Sunshine Village, a shopping area with a variety of shops, Brown’s Social House restaurant and Safeway Grocery is conveniently located in the neighbourhood. Sunshine Hills is considered a prestigious area of North Delta and is an up-scale neighbourhood. An avid golfer? Sunshine Hills Golf Center and Delta Golf Course are also nestled in this area of North Delta.